Plain Living and High Thinking: Durability is a Green Issue. Durability is a Green Issue. More and more lately I have been making every effort to resist things that are flimsy and cheap, no matter how inexpensive they are, and just bite the bullet and pay a little bit more for something that is going to last. Of course I’ll save money in the long run, since I won’t have to replace the item as often, but the initial investment is still a bit of a stumbling block, since I am essentially living on a poverty level budget, and even if I wasn’t I am still a cheapskate. Sometimes it’s just not possible, but I do try my hardest. Of course society doesn’t make it easy, with disposable this and that and everything else, and all the consumer goods with planned obsolescence. Plastic is something else I try to avoid on principle, because the whole chemical-leeching thing is really scary, and it’s never going to degrade, and over time the surface tends to get either dull or slimy or gummy. I have a set of plastic measuring spoons that are only a few years old but are mostly useless, because the measures are rubbed off (they were just painted on) so I have to guess, Is this a teaspoon? My cheap measuring spoons lasted about five years before the printing started wearing off, and the matching cups are on their way there, and eventually they’re all going to get sticky and unpleasant to work with, because that’s what plastic does, and then they sit in a landfill until the end of time. I really like my new metal measuring cups, because so long as they are well taken care of, they will last my lifetime, and probably a couple lifetimes after that, but they will eventually rust and degrade and go back to the soil from whence they came. I might eventually buy another set of them (because it’s easier to bake with two sets of cups and spoons) but I probably won’t have to ever replace them. 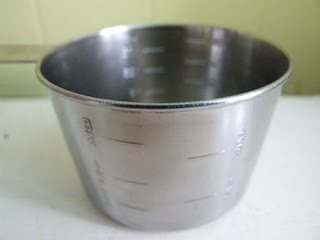 And, look, the metal one cup measure has increments printed on it, fractions of a cup on one side and milliliters on the other. How cool is that? I think stainless is a great choice for measuring cups. I love mine. I am also trying to resist items made in China, but I agree it is very difficult. Chocmoon from Light Green Stairs. Hi Chocmoon! It's really sad that it's so difficult to avoid products that are made in sweatshop conditions, especially if you don't have a lot of money -- you shouldn't have to be rich to have a social conscience.